Can’t We Talk about Something More Pleasant? : A Memoir – loudlatinlaughing – Euge! Euge! 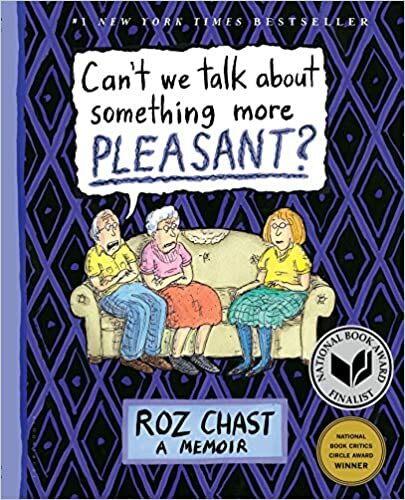 An excellent graphic memoir by Roz Chast that I was turned onto by her current exhibition at the Jewseum. Instead of reading the panels one by one on the walls, elbowing other spectators aside so I could get a closer look, I borrowed the memoir in book-form from the library. I’ve been coincidentally reading a lot about death after hearing Ann Neumann on the radio recently, and this memoir is a wonderful addition to the topic. Chast tackles the difficult subject of watching her parents decline rapidly once they pass age 90, but they refuse to discuss basic things like living wills or how they’d like to go off into the sunset. After her dominant mother falls one too many times in their dusty and grime-encased Brooklyn apartment, she manages to pull them into a assisted living facility in Connecticut near her family. Her dad has been sinking into dementia for years and her mother never regains strength after a few weeks in the hospital. Their decline continues, achingly slowly, and expensively. Chast watches as the bills mount and silently thanks her parents for squirreling away what tiny amount they could, but even that pile is melting quickly. I particularly appreciate the honesty she shows in dealing with her feelings —she’s never been particularly close to her mother and does not have a change of heart at the end.